The type of soil in your landscape largely determines how often you should water. Each soil type has its pros and cons. For example, while Clay soil retains so much wonderful organic matter, it is really dense and therefore difficult for water to move through. How do I know this? Because in Oregon, where I spent my childhood and lived for most of my adult life, I had clay soil, and now, although I moved over 600 miles away to another state, I find myself with clay soil again. Clay and I go way, way back. Clay. Clay has small particles, so clay soils become compacted, and that restricts the movement of water through them. Because the water does not drain well in clay soil, it holds more moisture than any other type soil. Clay absorbs water slowly as well. Infiltration is the rate at which water moves into soil. Clay soils have the slowest water infiltration rate, 0.04 to 0.2 inches per hour. Clay soils hold more water than sandier ones and can go longer between watering than sandy soils. However, overwatering Clay soils can lead to lakes pooling at the base of your plants and subsequently, to root rot. Silt. Silt has a smooth texture that is similar to flour. It also has the ability to hold moisture almost as well as clay. Loam. Loam soils are a mixture of fairly equal parts of clay, silt and sand. Loamy soils are considered ideal for gardeners because they drain well and hold plenty of moisture. They hold less moisture, however, than silt and clay soils. Sandy. Sandy soils have large particles, and the spaces between those particles are large as well, which means water drains very quickly. Sandy soils have a rapid water infiltration rate of greater than 0.8 inches per hour, but they do not have the capacity to hold water. So they usually have less moisture content in them than clay, silt or loam soils. Rock and Gravel. Soil with high amounts of rock or gravel drain very quickly. Because it does not have the capacity to hold water at all, these soils have the lowest moisture content of all soil types. The soil is sometimes referred to as “droughty soil”. 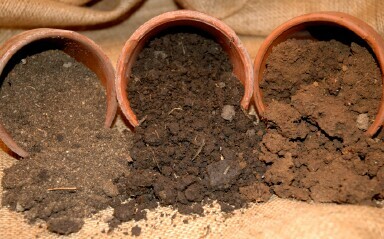 You can try a few tests to get a general idea of your soil type. The Squeeze Test. To do this test, be sure your soil is damp, but not soaking wet. Grab a small handful of the soil in your hand. Rub some of the soil between your fingers. If it feels gritty, it’s mostly sand. If it feels slick and slimy, it’s mostly clay. The Ribbon Test. Take a handful of damp soil and make a ribbon by rolling the soil between your hands. If you can form a ribbon and hold it vertically without it breaking, you have mostly clay soil. 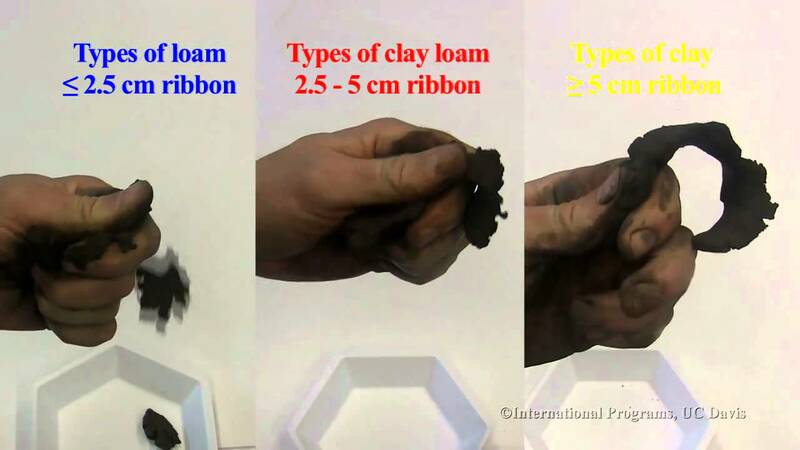 If you can make a ribbon, but it breaks off when you try to hold it up, you probably have a mixture with less than 50% clay your soil. If you can’t make a ribbon at all, chances are your soil is more than half sand. Reblogged this on The Bohemian Troubadour.